If you’ve got five or seven people to bring with you on your travels around Birmingham, AL and beyond, the 2015 Nissan Rogue from Benton Nissan of Hoover makes a great choice. These versatile crossovers are great for families of any size and make it easy to bring your whole crew on any adventure. 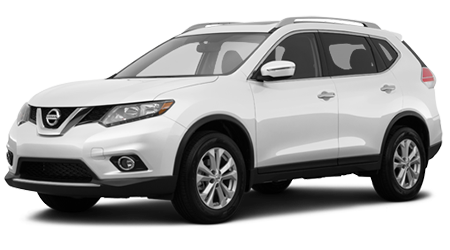 Nissan made things simple with the 2015 Rogue, with just one motor and transmission available. They all come powered by a 2.5-liter four-cylinder with 170hp hooked to a CVT automatic. Front-wheel drive comes standard, but a great all-wheel drivetrain is optional on all trim levels. Advanced airbags, antilock brakes, stability and traction control, and a rearview camera all come standard. In EPA tests, the continuously variable transmission helps the Rogue get 26 mpg city and 33 highway, with AWD models giving up 1 mpg in both city and highway tests for better all-weather reliability. The Rogue was an all-new model just last year, so only a few things have changed for 2015. The Rogue is still available in S, SV or SL trim. The Rogue S model includes convenience features like keyless entry, power everything, air conditioning, tilt/telescoping steering, cruise control, and a CD player. The stereo also features Bluetooth streaming, USB/iPod connectivity, and an auxiliary input. The Rogue SV comes with standard 17” alloy wheels and adds interior goodies like proximity entry with pushbutton start, tinted glass, and the NissanConnect system with smartphone integration, satellite radio, and six speakers. Rogue SL models get the plush treatment with leather upholstery, front seat heaters, and voice-controlled GPS navigation with a touchscreen display and a Bose eight-speaker stereo. The Rogue SL also gets a birds-eye-view parking camera and 18” alloy wheels. The Rogue comes standard with seating for five in two standard rows, but the optional Family Package for S and SV models adds a 3rd row with two more seats and run-flat tires. Now, thanks to the 2015 Nissan Rogue, you don’t have to drive something the size of a bus just because you occasionally need to carry more than just your kids on carpool day. Stop by Benton Nissan in Hoover, AL and how affordable it can be to bring everyone with you in the same car.